I can’t write about what kneeling at NFL games means – to the kneelers – better than Elizabeth Bruenig here. When I read that politicians believe that players who kneel during the National Anthem are unpatriotic, I feel angry. No kneeling football player has ever said that their decision to kneel was intended to disrespect the flag or the national anthem. But kneeling has been outlawed by a unanimous vote yesterday of the NFL team owners. 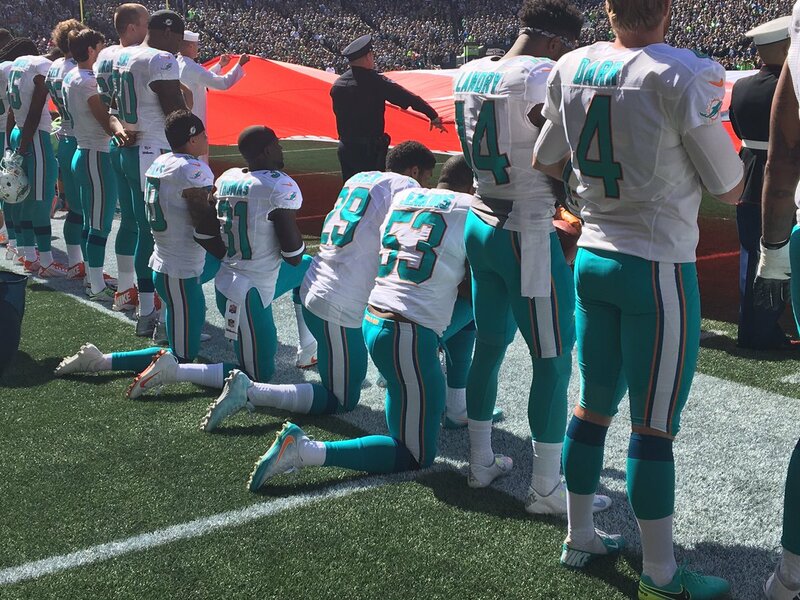 As Dr. Bretherton mentioned, kneeling means that something is desperately wrong. “Please hear us and use your power to help us.” Those desperately wrong things include police brutality against unarmed Black men and arrested teenagers being held in solitary confinement before their trials – sometimes for months. A Canaanite woman knelt before Jesus begging him to help her. The father of a child with epilepsy knelt before Jesus begging him to heal his son. Peter knelt in prayer asking God to raise Tabitha from death. Hopeful people kneel. Desperate people kneel. Some of us are hopeful and/or desperate for change to the point of kneeling in hopes that those in power will act. And some of us get angry about such kneeling during the National Anthem. Both sides are patriotic – one ostensibly realizing that we do not yet have justice for all and one ostensibly believing that pledging “justice for all” is enough. Perhaps we all need to kneel more often remembering who ultimately has the power. It’s the Spirit of God who moves us to change things so that there might indeed be liberty and justice for all.